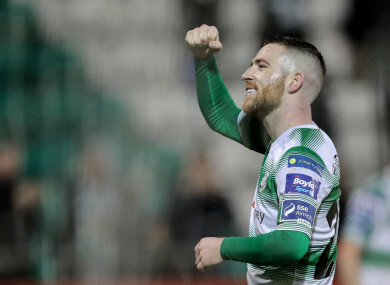 Jack Byrne celebrates after Shamrock Rovers' win against Sligo on Friday night. SHAMROCK ROVERS MIDFIELDER Jack Byrne has been called up to the Irish senior squad for the upcoming Euro 2020 qualifiers against Gibraltar and Georgia. Byrne scored a stunning goal against Sligo Rovers in front of the Irish management team at Tallaght Stadium on Friday night, and McCarthy has now included him in his 23-man squad as a replacement for the injured Callum O’Dowda. O’Dowda is ruled out with a knee injury, and the Bristol City midfielder joins Ronan Curtis and Alan Browne in being forced to withdraw through injury. Kevin Long and Josh Cullen have joined Byrne as late call-ups. Byrne and Cullen have been called up in spite of their not being named in McCarthy’s initial, 38-man provisional squad. “He was the best player by a distance in a good team performance by Rovers and his goal was the icing on the cake. I was impressed with his vision, his range of passing and his passion. Robbie has trained with Jack with the senior team before and speaks highly of him so I wasn’t surprised by his contribution. Should he make an appearance in either game, Byrne will become the first League of Ireland player to play a competitive senior game for Ireland since Rovers’ Pat Byrne did so against Denmark in 1985. The squad gather at RTÉ Studios tonight for the FAI International awards, and will report for training at Abbottstown tomorrow morning. Keiren Westwood, Richard Keogh and Conor Hourihane have been given permission to link up slightly later with the squad, but all are expected to train on Tuesday. Email “Jack Byrne drafted into Ireland squad for qualifiers against Gibraltar and Georgia”. Feedback on “Jack Byrne drafted into Ireland squad for qualifiers against Gibraltar and Georgia”.